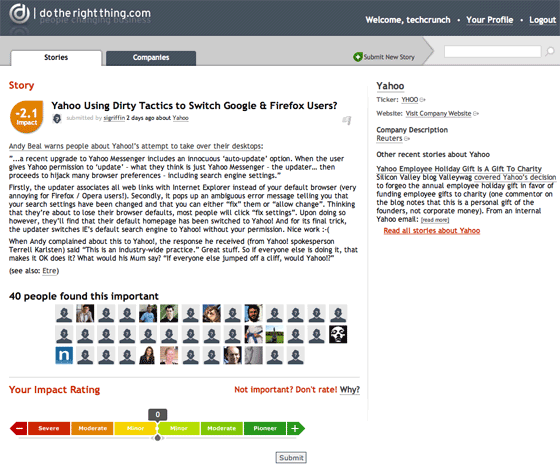 I took a look at new startup DoTheRightThing this evening. This is a Digg-like site where people submit stories about companies acting in ways that can be considered “good” or “bad.” Other users then vote on the goodness or badness of those actions, add comments, etc. An overall “goodness” score, ranging from “severe” on the negative end to “pioneer” on the positive end is calculated and displayed. The company hopes that companies will take notice, realize that non-financial results matter to society, and change bad behaviors. Since they are somewhat hypocritically a for-profit startup, they hope to make a buck or two along the way as well. As you would expect, the site is filled with typical rants against Walmart and other easy to target companies. One Scottish company is being attacked because they ship scampi to Thailand to be hand peeled prior to being shipped back to the UK for consumption. “This is revolting” says one user. On the other end of the spectrum, anyone wearing and selling red stuff is celebrated because they, and apparently they alone, care about people with AIDS. One misguided user posted a not so popular rant suggesting that corporations should not be held accountable for all of the worlds ills. This posting has a very low rating right now. I’m guessing people like that will be quickly beaten out of dotherightthing.com, leaving a smug nest of Toyota Pious driving do-gooders behind to fix all of our problems by complaining about them in unison.